The 1999 season began at the camp on June fifth. For whatever reason, all the salmon runs showed up late in 1999. This made the start-up weeks for the various salmon species a little different than expected. The week of June 5 - 12 was hosted by Guide Jim Brighenti and cook Tommy Scherl. Clients were Tom & Jamey Watson of New Mexico and Ted and Steve Dennis of Oregon. King and sockeye fishing started out very slow with late fish and high water. The saving grace for this week was the unusually high number of steelhead. The group landed 22 steelhead in the beginning of the week and finished with 12 kings on the last couple days. The week of June 12 - 19 was again hosted by Jim and Tommy. Clients were the Jose Parrilla party from Barcelona, Spain. The salmon hit well by the second day and the group finished up with 154 kings and 86 sockeye landed. The King and sockeye fishing continued to be strong for the next month. On June 19, I (Dave Jones) returned from an un-scheduled leave to replace Jim as the guide in camp. 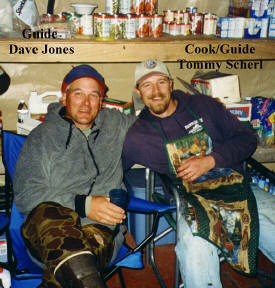 Tommy and I served as hosts for the remainder of the season. The best king salmon fly fishing day in the history of the camp occurred during the week of June 19 - 26. The cast of clients were Paul Hermann, Larry Catleit, David Ledlie and Wayne Moody, all from Maine. On Friday, June 25th the group landed a total of 60 kings! 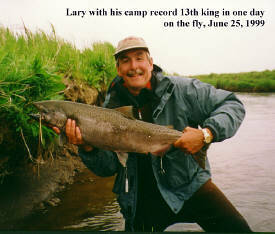 The shining star was Larry Catleit who landed 13 of his kings on the fly for a new camp record. Most of the fish caught by this group were landed on reels made by Paul Hermann himself. Paul builds a beautiful and durable reel in the classic Atlantic salmon design. If you're reading this Paul, thanks again! In camp for the week of June 25 - July 3 were Ray & Alice Hallberg of Oregon, Kiko Torrego and Roberto Imperatori both from Spain. Ray and Alice are veterans of many Alaskan fishing trips but Alice was still able to achieve a personal first on this trip. She landed her first ever king salmon on a fly. 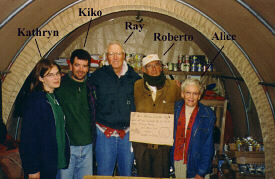 Kiko was on his second trip with our organization, he had visited once before in 1996. The Thaulow family, from Oslo Norway, visited the camp in the week of July 3 - 10. Eric, his wife Ida and sons Hakon and Ditlef were on their first trip to Alaska. It's always a pleasure to show the beauty and excitement of this area to newcomers and the Thaulow's were no exception. They learned a lot about fly fishing, caught a blizzard of fish and enjoyed some great bear viewing. July 10 - 17 was the last week before the camp's mid season break. We were joined by a very experienced group from Idaho. Bob Price, Ed Bews, Frank Varriale and Steve Rambo had all fished the river for kings several times in the past. They put their skill and experience to work and landed 246 king salmon during the week. We are looking forward to seeing this group and some additional friends for a trip scheduled in June of 2000. August 1st found Tommy and myself joining Robin Reed at his R&R Lodge. The three of us served as hosts for the "August in Ugak Bay" portion of the 1999 season. Pat Steed and son Terry, John Kim and grandson Greg, all of North Carolina, joined us for the week of August 1 - 8. Pat was on his third trip with our organization after visits to the camp in 97 & 98. John was on his second after visiting the camp in 98. The week started out with some fine silver salmon and halibut fishing aboard Robin's boat. We pretty well had the freezer loaded after the first day. A mid week storm put a stick in our spokes for a few days. We were able to tough it out and still get some fishing done. A soak in the nice hot banya sure felt good after a day battling the wind and rain. The week finished well with fly-outs for freshwater fly fishing. We are looking forward to seeing John in July of 2000 and Pat in September of 2000. Bob Devereaux and son Greg are veterans of many trips with our organization. They visited Olga Bay on several occasions as well as a trip to Ugak Bay in 98. During the week of August 8 - 14, Bob and Greg were joined by Alice and Ray Hallberg. Alice and Ray were on their second visit of the year after fishing at the camp in June. The group enjoyed saltwater fishing for silver salmon, Ray landed several saltwater silvers on his fly rod. Also caught in the salt were some halibut, rock fish and a King Salmon. We made two fly-outs during this week for sockeye and pink salmon, dolly varden and rainbows. Dolly varden are one of Bob's favorite fish so the group kept about 30 of the 175 we caught on the fly-outs. We were also treated to some fantastic bear viewing . Greg and I stayed near sea-level on this trip but on his visit to Ugak Bay in 98, the two of us climbed Mystery Mountain (4,100 ft). 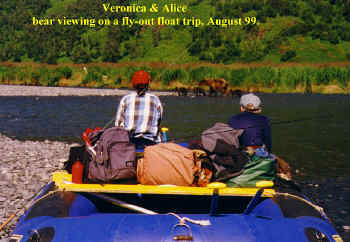 We are looking forward to seeing Bob and Greg on their trip planned for August of 2000. Art Kelly, Wilbur Bullock and Donnie Daniel, all from Mississippi, along with Charlie Sirmon of Florida were guests in Ugak Bay during the week of August 14 - 21. All of these gentlemen were returning to our organization after visiting the camp in 98. Fishing during this week was a great mix of salt and freshwater opportunities. In the salt, the highlight was light tackle halibut fishing. The whole group landed halibut on light rods 15 lb line. Donnie was the champ with a fish over 100 lbs. In the fresh, Wilbur really excelled at fly fishing for trout. The week had some great wildlife viewing opportunities as well. We got up close and personal with a large group of humpback whales, saw false killer whales, seals, sea lions and got some great bear pictures. 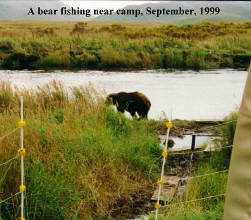 August 21 - 28 was the final week of the Ugak Bay program for 1999. Guests included Peter Felber, Walter Felber and Hiner Spatz, all from Switzerland. Peter, Walter and Hiner were returning to our organization after several visits to Olga Bay. Also joining us from Germany was Lajos Vaczi. We were treated to some great bear viewing during this trip. While on a fly-out, both Peter and Lajos captured a large sow catching a king salmon on their video cameras. The event occurred no more than 20 yards away from us and you could clearly hear the crunch of bone as the sow devoured the big fish. While fishing, Walter caught a giant halibut. We released the fish so we don't know the exact weight but it was a dandy. Peter excelled as a trolling skipper, he drove our boats into many silvers and had one morning which produced 8 kings. September found Tommy and myself back at the camp. Joining us in the week of September 4 - 11 were Kurt Gartner and Johann Penitz from Austria, Stu Brandes and his daughter Marcia from Wisconsin. 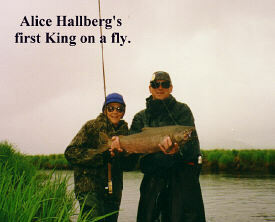 In keeping with the rest of the salmon in 1999, the silvers were late as well. This group did a great job in catching the ones that were available however. Led by Marcia the group was able to land a total of 75 silvers for the week. Kurt and Johann worked hard on some downstream hikes for several silvers on the fly and some surprise early steelhead. The dolly varden fishing was outstanding in early September of 99 which encouraged the holding of several one fly competitions. In a one fly competition a contestant can choose any one fly to fish with, lose that one fly and your out. Use light tippet and you'll hook more fish but you may also break off. Johann won the one fly for this week by landing 30 dolly varden in just over one hour. During the week of September 11 - 18, Walter Maslowski, Fred Rohdes, and Darrel Long of Ohio and Joe Steuer of Florida were guests at the camp. Walter has visited our organization every year since his first trip to Olga Bay in 1989. He is one of our most frequent guests and has become a dear friend. Joe and Fred were also return visitors having visited Olga Bay in years past. Fishing for silvers continued slow for this week. Walter caught the largest silver of the week on the second day, a fish of about 16 lbs. The dolly varden fishing continued strong and we ended up having two one fly competitions. In the first, Joe got off to an early lead but lost his fly and Darrel went on to win. In the second, Joe used a fine wire leader, he kept his fly throughout the contest and won it in the end. We are looking forward to seeing Walter on his trip planned for September of 2000. Alex Willis, Wade Ward, Jim Slack and Charles Efird, all from North Carolina, were at the camp for the week of September 18 - 25. Alex, Wade and Jim were on their second trip with us, they had visited the camp in 97. The silvers finally hit in force during this week and the group ended up landing 259. On the last day, steelhead began to show as well. Charles caught the first but Wade caught the most. We had a one fly competition of sorts during this week as well. Jim won the contest with a combination of 20 silvers and dollies. Wade was closing in on Jim but fell victim to sabotage. While pretending to be a friend and help Wade to land a fish, Charles secretly cut Wade's line. It's possible that Jim paid Charles to perform this dastardly deed. At the camp in the week of September 25 - October 2 were Josh Lewis of Kodiak, Dennis Frome of Oregon, Jim Kinghorn and Keene Smith both from Colorado. Josh is a veteran of a past camp trip in 98. Silver fishing continued strong and steelhead fishing lit up as well. Despite some very heavy rains in the latter part of the week, the group landed 37 steelhead. The largest steelhead was a beautiful 36" buck caught by Keene. Bear viewing was good for the whole group but was especially good for Dennis. I'm not sure what kind of aftershave Dennis uses but it really attracts bears. On Tuesday of this week Josh returned to his teaching job in Kodiak and was replaced by Gary Carver, also of Kodiak. The heavy rain of September 29, 30 and October 1 caused the river to flood. On October 2, the outgoing group was forced to evacuate the camp in the early morning hours and await their float plane pick-up on higher ground a couple miles down stream of the flooded camp. The clients who were to come in on this day were contacted in Kodiak and advised to remain there. Tommy and I, working in waist deep water, broke down the camp. We returned to Kodiak on Tuesday, October 5. Fritz Jorg of Washington, Chris Gill of Texas and Mark Davies from France were all staying at a hotel in Kodiak after there trip to the camp was cancelled because of the flood. 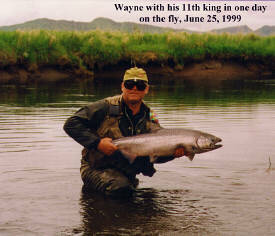 Fritz has fished with our organization in every year since his first visit to Olga Bay in 1988. He is our single most frequent visitor and a dear friend. 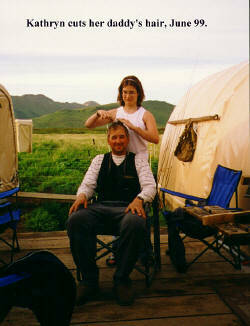 Chris is also a veteran of many trips with us both in Olga Bay and at the camp. 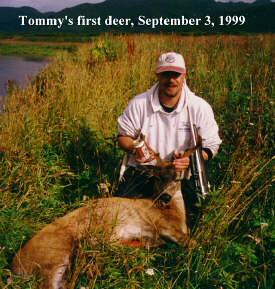 Had things gone as planned, Mark would have been on his second trip to the camp after visiting in July of 98. It was disappointing to have to cancel the trip to the camp but this group didn't sit on their hands. While Tommy and I were working to put away the camp, Fritz, Chris and Mark fished the rivers on the road system. After my return to Kodiak, we put together a quick camping trip for the remainder of the week. We had a quick flash of great silver fishing with several triple hook-ups after which the fishing slowed. Chris landed the largest silver I saw in 1999, it was approximately 18 lbs. We finished strong on the bear viewing for a consolation prize. Naturally the group was issued a combination of refunds and credits for future trips. We are looking forward to seeing both Fritz and Chris in 2000. Chris has trips planned for both July and October. Fritz plans to return in October. Special thanks to all of you who visited us during the 1999 season. We sure appreciate your business and enjoyed your company. If you have some pictures or comments you would like me to add to this review, please let me know.